Hi! Hi! Hi! We are going strong here At The Picket Fence! We’re working our way through several fun holiday crafts and projects as well as showing off our homes all decked out for Christmas! 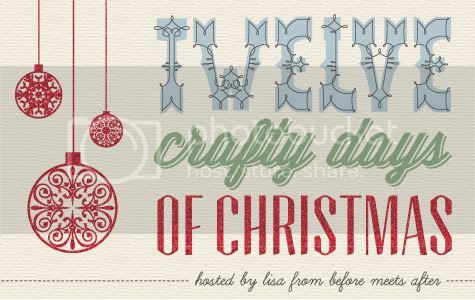 Today we are so excited to BOTH be sharing a fun and festive Christmas craft with Lisa at the Twelve Crafty Days of Christmas Series over at Before Meets After. My Tale of Three (Dollar Tree) Pumpkins Project was so popular this fall, I thought I’d do a Three Dollar Tree Wreaths series as well. Because of the timeframe….can you BELIEVE Christmas is less than two weeks away? !…I decided to throw caution to the wind and feature all three wreaths in one post! I’m going to share two of them here…and then you’ll have to visit us over at Before Meets After to see the third wreath in the series! UP FIRST! The one you’ve all been asking about.. Many of you saw this one when I revealed my kitchen remodel for the Christmas in the Kitchen party…which by the way is still open for links! This was the first wreath I envisioned creating when I visited the Dollar Tree way back in November to check out their holiday items. This wreath couldn’t have been easier! Begin by hot gluing your candy canes one at a time around your wreath. Make sure that the ends are tight together, and ends of candy canes are right up against the opening of the wreath. The tops of the candy canes will be farther apart then the bottom, and the first candy cane will rest on top of the next as seen in the picture below. When you have all of the candy canes attached, if desired apply craft glue to outer edge and inner edge of wreath and sprinkle with glitter for a pretty finish! and hang in a fun place to show off your awesome new wreath! Second, we have a wreath that is similar to one I saw floating around from Better Homes and Gardens but couldn’t find instructions on anywhere. So I decided to create my own…and from Dollar Tree items of course! 1. Begin by laying out your largest snowflakes to create a rough circle the size you would like for your wreath. Hot glue the points of the wreaths together, with the largest points out. 2. Once the glue has dried, begin layering your smaller snowflakes on top of the large ones in a pattern that is pleasing to you. Once you have them where you like them, hot glue them to the bottom snowflakes and to each other until they are firmly attached. Add an additional layer until you like your overall design. Once the glue has dried wrap wreath with a wide ribbon in the color of your choice and hang! I hung this wreath over my Framed Chalkboard in my dining room…Let It Snow!! So do you wanna see how I made this one? Well you’ll have to head over to Before Meets After to see the tutorial. Vanessa will also be sharing these gorgeous knock off stacked candlesticks! So meet us over there, and learn how to make these two fabulous holiday projects! We’re looking forward to sharing our fun Christmas crafts with you! 41 Comments on "Three Dollar Tree Wreaths"
Dollar Store Diva’s that what we are! You really know how to create beauty! Love it all! Of course, if I recall the Dollar Tree pumpkin projects, my lame DT didn’t even have the pumpkins so I was left with craft envy. But I’m still pinning, by gum. Beautiful, and easy too! This inspires me to give it a try! Love them! I sure will be making some of these wreaths for next year! Thank you so much for showing us how to do it. What great ideas..They are beautiful and economical..
Heather those are adorable!! I love the snowflake one and where you hung it. I absolutely love your dollar store wreaths! I can’t even pick a favorite but I going to share them on Facebook and Twitter. Thanks for the inspiration! Gosh, you’ve got my head spinning with ideas. It looks like you can make a wreath out of just about anything! I didn’t realize those candycanes weren’t real. The dollar store seems to be a great place to find affordable materials for these projects. Thanks for the tutorials. LOVE the snowflake wreath! Pinning! I ♥ the candy cane wreath, it will never go out of style! Love these, especially the candy cane wreath. You are the Queen of Wreaths. Seriously creative. I will be heading over to check out how to make that third wreath. They are all gorgeous. Love, love, love!! Especially the candy cane wreath! I’m your newest follower! These are fabulous ladies!! I must run down to ours Dollar store and see if I can find some of those candy canes! These are awesome! I just love the Dollar Store! Thanks for sharing such great ideas! I am in love with the candy cane wreath!!! And I’m your newest follower. Adorable! They are so cute! Great job! I want to go hang out with you girls! Don’t know what I would do without that Dollar Tree. My entire home is decorated with those lovely snowflakes this year. ANd your wreaths are just gorgeous ladies! This is Fabulous Heather. I will try the snow flake wreath. It’s soooo beautiful. Love both of your wreaths but the candy cane is my favorite. Very cute ideas. Interest in michael kors outlet’ designs has sky rocketed since he first began his duties as judge on Project Runway that he isn’t interested in selling his almost-majority stake to a higher bidder. I am not trying to be combative, but it’s worth a look for you from michael kors outlet. 9 Super Cool Candy Cane Ideas! | CraftyChica.com | Sparkly, artful inspirations by artist and author, Kathy Cano-Murillo.